Two new corridors to link Delhi with Haryana, U.P. Two new corridors have been identified for expansion of the Regional Rapid Transit System (RRTS) that will link the national Capital with Haryana and Uttar Pradesh. Following a meeting of the representatives of Delhi, Haryana and Uttar Pradesh with Union Urban Development Minister Kamal Nath on Thursday, it was announced that the RRTS will be expanded to the Delhi-Bahadurgarh-Rohtak-Hissar corridor and the Delhi-Shahadra-Baraut corridor. Announcing this, Mr. Nath said these corridors will be taken up on priority basis and feasibility studies will be conducted soon. The feasibility report on the Delhi-Alwar, Delhi-Panipat and Delhi-Meerut corridors has already been completed and work on the detailed project reports will begin soon, the Minister said. These three corridors of phase-I will cost approximately Rs.72,000 crore and all the States concerned have agreed to pull out all stops for RRTS construction, he said. A representative from Uttar Pradesh said the Government is committed to have a RRTS in place and will not let monetary considerations come in the way of development. “The Uttar Pradesh Chief Minister is clear that the State will do whatever is needed to create new economic opportunities. We will ensure the feasibility of the Delhi-Bahadurgarh-Baraut corridor is carried out fast. The Government will not allow money to hinder the economic development. We need to weed out corruption and instead spend money on public works,” Abhishek Misra, Minister of State for Protocol, UP, said. The RRTS is an ambitious project that aims to create counter-magnet areas around the National Capital that will decongest the city and allow people to commute between NCR easily. “The RRTS will allow people to commute to Delhi for work, while living elsewhere. The projects are being fast tracked,” said an official of the Urban Development Ministry. Thursday’s announcement that all the stakeholders have agreed to raise funds and work on priority have also laid to rest the speculation that the RRTS will have difficulty taking off, on account of no consensus on land acquirement and fund-raising among the three States of Delhi, Haryana and Uttar Pradesh. There have been concerns that the States may not be able to raise the money required to fund the massive project. Due to be integrated with the Delhi Metro, RRTS will serve the Delhi – Gurgaon – Alwar, Delhi – Sonepat – Panipat and Delhi – Ghaziabad – Meerut corridors. NEW DELHI: Daily commuters from satellite towns can look forward to a hassle-free ride into the Capital with the urban development ministry "in-principle" okaying the rail-based Regional Rapid Transit System (RRTS) to provide fast connectivity from places like Meerut, Alwar and Panipat. The integrated system – involving new railway lines, Metros, bus clusters and terminals – is aimed to provide a smooth travelling experience to lakhs of people who commute to Delhi every day for work. It is also expected to considerably ease traffic congestion in the Capital and check migration. "Faster connectivity will reduce pressure on the Capital's infrastructure by opening up the region including regional housing market," urban development minister Kamal Nath said, emphasizing that RRTS should be integrated with the Delhi Metro. The long-pending transport system, to be built over the next 25 years, will come up on three corridors – Delhi-Ghaziabad-Meerut, Delhi-Gurgaon-Alwar and Delhi-Sonepat-Panipat. As the project will be very capital intensive, the minister has directed the National Capital Region (NCR) Planning Board to explore innovative funding mechanisms like exploiting transit-oriented development potential, monetization of land and PPP model. The move to develop an extended transport infrastructure has been necessitated by rising traffic volumes, which include more than 3.5 lakh passenger cars entering the NCR every day. Nath said it was necessary to focus on the sub-urbanization process and infrastructure development outside Delhi to enable other areas of NCR to absorb the load on the Capital's resources. NCR Planning Board has been asked to take the lead in planning and developing greenfield townships on these transport corridors in partnership with the state governments concerned. The board signed an agreement in June with Delhi, Rajasthan, Haryana and UP to set up a separate body — NCR Transport Corporation (NCRTC) — to improve transport interconnectivity in the NCR. The new body will monitor and implement a comprehensive public transportation plan for the region. The NCRTC "will be responsible for overall development of integrated multi-modal transport system, including rapid rail transit system (suburban rail system) and feeder bus services in the NCR". It will have representatives of the four state governments, urban development ministry and railways. Centre's contribution to the corporation is 50% and each state is required to invest 12.5% equity each. 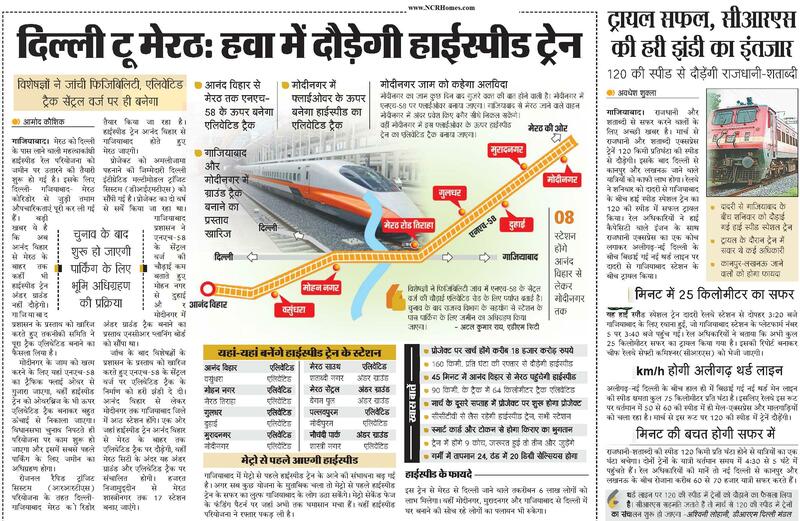 The dream of a shorter journey to reach Meerut, Panipat and Alwar from the Capital could come true in the near future. The urban development ministry has in principle given its approval to three regional rapid transit system (RRTS) corridors, which will vastly improve Delhi's connectivity with its three neighbouring cities. Urban development minister Kamal Nath approved the concept proposal of implementing the RRTS in three important corridors in the NCR. The corridors for which the approval has been given are Delhi-Gurgaon-Alwar, Delhi-Sonepat-Panipat and Delhi-Ghaziabad-Meerut. The minister also emphasised that the RRTS should be integrated with the Delhi Metro. This faster connectivity will reduce pressure on Delhi's infrastructure by opening up the region including the housing market. A transport department official said multi-modal stations will be provided in Delhi to integrate the RRTS with the Delhi Metro and the DTC. There will be feeder services also. The RRTS is a rail-based mass transit system that will connect distant areas of the NCR to the Capital. Nath also directed the NCR Planning Board to explore funding mechanisms. According to officials, it may take about four years but one will be able to travel to these cities in half the time it now takes – on high-speed bullet trains running on dedicated tracks at a maximum speed of 160 km an hour. According to an estimate, one would be able to reach Meerut in 63 minutes, Alwar in 117 minutes and Panipat in 61 minutes. GURGAON: Soon, a high-speed train link will connect Delhi and Alwar (Rajasthan) via Gurgaon. The train, which will ply on a 158-km-long route, will have a swanky look similar to the Delhi Metro trains, and would cover the distance in around 115 minutes. It is expected to receive a daily passenger load of nearly 7.43 lakh and its speed is likely to range between 160kmph and 180kmph. The exact coordinates of the route have not yet been decided but it has been proposed that the link will have 16 stations and the train tracks might be built close to the existing railway lines. The government has also planned to align the track to enhance the speed of the train. The project is an offshoot of the Regional Rapid Transit System (RRTS) corridor in which Delhi will have dedicated superfast rail link with the NCR. Among the proposed routes, Delhi will be connected to Bulandshahar, Meerut, Sonipat, Alwar and other places. In a meeting held last Friday, Haryana government officials met the urban development ministry and other government stake-holders involved in the ambitious project. Senior officials discussed the details of the high-speed Delhi-Alwar link, its tentative routes and other operational aspects including the places it would pass through. Confirming the development, the finance commissioner, Town and Country Planning, S S Dhillon said: "The plan is in its conceptual stage and the state government is committed to the RRTS project." As per the proposed plan, he said, the rail link will connect Gurgaon, Rewari, Pawal and then Alwar. The upcoming rail link will play a crucial role in bolstering overall industrial development of the Gurgaon-Manesar region. RRTS will solve the problem of traffic jams faced by passengers arriving and departing from Delhi from the NCR region. According to sources, these projects will be further integrated with the Metro train and Bus Rapid Transit Corridor (BRTS) to provide easy access to internal destinations in the city. The National Capital Planning Board had signed a Memorandum of Understanding (MoU) with the central government and four states for implementation of the RRTS. गुड़गांव टु अलवर हाई स्पीड सफर! Delhi-Alwar in 117 minutes ! Jaipur: A Delhi will be just 117 minutes from Alwar as a rapid transit corridor is proposed to connect the two cities. The National Capital Planning Board signed an MoU with Government of India (GoI) and four states for implementation of Regional Rapid Transportation System (RRTS). The Rs 17,63,545-million project will have eight corridors connecting Delhi to Alwar, Meerut, Palwal, Khurja, Panipat, Hapur and Barut cities. "The first phase of the corridor will commence between Delhi–Alwar in 2016, the transportation corridor will be develop in accordance to the concept of "Bullet Train" said GS Sandhu, principal secretary urban development and housing (UDH), Rajasthan. RRTS will solve the problem of traffic jams faced by passengers arriving and departing from Delhi from NCR region. These projects will be further integrated with the Metro train and Bus Rapid Transit Corridor (BRTS) to provide easy access to internal destinations in the city. In Rajasthan Alwar will be connected to ISBT Kashmere Gate in Delhi through a fast moving dedicated train corridor. The train moving at a speed of 160 kilometer per hour will connect New Delhi Railway Station, Sarai Kale Khan/Nizamuddin Railway station and Dhaula Kuan (through Metro) inside Delhi. While Gurgaun Manesar, Dharuhera, Bhiwadi, Rewari, Bawal, Shahjahanpur and Khairthal. The 118 kilometre long distance will be covered in just 117 minutes, and is expected to receive a daily passenger load of near 7.43 lakh. The project can make Alwar entry gateway for passengers travelling to National Capital from Rajasthan. Forced to use their private vehicles or travel by rickety trains and buses, lakhs of commuters in the National Capital Region (NCR) now have a reason to cheer. The government has decided to set up a separate body to improve transport interconnectivity in the NCR. The new body – NCR Transport Corporation (NCRTC) – will monitor and implement a comprehensive public transportation plan for the region. Structured on the lines of the Delhi Metro Rail Corporation, the NCRTC "will be responsible for overall development of integrated multi-modal transport system, including rapid rail transit system (suburban rail system) and feeder bus services in the NCR". The corporation will have the four state governments of Delhi, Uttar Pradesh, Haryana and Rajasthan work in tandem with the ministries of urban development and railways. One of the biggest advantages of having the new corporation is that it will eliminate any conflict of interest between the state governments by treating the NCR as one region rather than four different administrative units. The NCRTC will function under the command of the urban development ministry, which has conceived the project. The project will initially receive a funding of Rs 100 crores from the Centre. For their part, the state governments will be required to invest in the form of equity. The NCRTC will also raise funds through commercial utilisation of land and infrastructure. The corporation will follow the roadmap provided by the integrated multi-modal transport plan prepared by the government two years ago. The plan proposed building a regional rapid transit system for the NCR, including new railway lines, metro systems, bus systems and terminals in the next 25 years. The decision to develop such an extended transport infrastructure is necessitated by the rising volumes of traffic, which includes 3.5 lakh passenger cars entering the NCR everyday. The plan, therefore, proposes building an extensive network of 16 new regional expressways spanning over 1300 km. Buoyed by the success of the Metro rail system in Delhi, the plan has proposed building similar systems to link various other urban centres in the NCR. The ambitious project also proposes building a rail rapid transit system to enable "safer, high speed and high frequency services". This would require construction of dedicated tracks. The plan proposes nine new lines which include Panipat-Meerut; Sonipat-Gohana; Sonipat-Jhajjar; Jhajjar-Gurgaon-Faridabad; and Meerut-Bhagpat-Sonipat lines. Augmenting the bus services also constitutes an integral part of the NCRTC. According to the plan, the buses will be equipped with the latest technology such as GPRS, electronic displays, ticketing systems, electronic route display systems, etc. The project also proposes construction of over 50 modern bus terminals and extension of Metro services to other urban centres in the NCR. 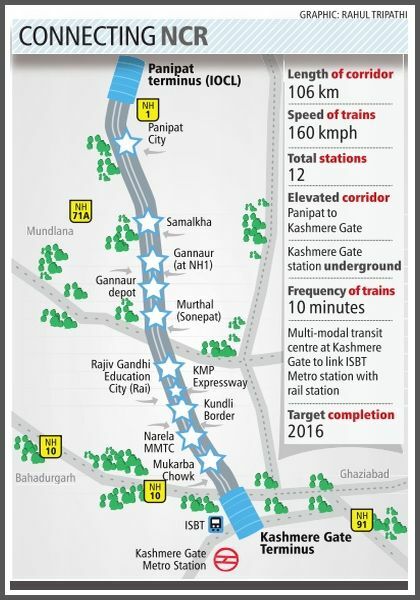 By 2016, commuters from Panipat can reach Kash mere Gate in the heart of the Capital in just 60 minutes, courtesy a high-speed rail link being planned to connect the National Capital Region. The current travel time between the two cities by road or train is not less than two-and-a-half hours. The 106-km Regional Rail Transit System link, with trains running at an operational speed of 160 kmph, will run through 12 stations on an elevated corridor. The project is part of a larger plan to connect NCR through three high-speed rail networks, connecting Alwar, Meerut and Panipat to the Capital. The National Capital Region Planning Board (NCRPB) has commissioned the Delhi Integrated Multi-modal Transit System (DIMTS), an autonomous government-funded body created for transport planning and solutions, to develop the detailed project reports for the Meerut and Panipat link, while the Urban Mass Transit Company is working on the Alwar link. The rail link will originate at Panipat terminus (IOCL), and run on an elevated track to terminate at Kashmere Gate right next to the existing Metro station. 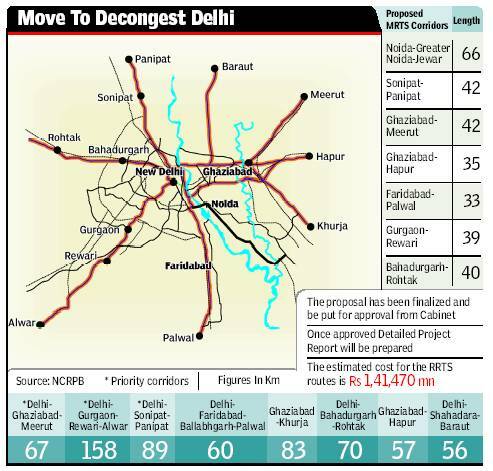 Sources said Kashmere Gate is expected to emerge as a major multi-modal transit centre linking the Metro, inter-state bus terminus and the rail link connecting the neighbouring state. The Delhi Metro is also planning another Metro station at the same point as part of its Phase-III network, which will be at the same level as the high-speed rail link station (20 m below ground level). The existing and upcom ing Metro stations will be connected internally to the rail station at the underground level, so that commuters can easily switch to the Metro system. The Haryana government gave its nod to the project last October, following which DIMTS has been working on the project report and business plan. A detailed engineering study, along with topography survey and geo-technical investigation, has already been conducted to understand the engineering feasibility of the project. A separate detailed report will be submitted along with the business plan in the next two months to the NCRPB for approval. The proposed link will come up on broad gauge to accommodate high traffic. Since the line will cover several rural belts, transit-oriented development zones (mixed-use residential or commercial areas designed to maximise access to public transport) are being worked out at Panipat IOCL, Samalkha, Gannaur Depot and Narela. At these four zones, new housing or industrial areas will get developed, which will also act as an extra source of revenue. The residents of Noida, Greater Noida and Ghaziabad NH-24 could soon enjoy high speed trains under Rapid Rail Transit System (RRTS) in Phase-2. Under the plans being developed by NCR Planning Board, Ghaziabad would be soon connected to Khurja and Hapur. The train to Khurja would pass through Noida Sec 62, Noida Ext, Lal Kuan, Dadri, Sikandarabad, Bulandsahar and Khurja. While the train from Ghaziabad to Hapur would pass thru Hi Tech Cities and Dasna to Hapur along NH-24.The new elevated track would be laid out along the existing alignment of Indian Railways. These trains would have stations at every 5-10 km and trains would run at 100 km per hour. The below GDA map shows existing railway stations on Ghaziabad-Hapur route. The track would be just 200 metre away from Uppal Chadha Hi Tech City. New Delhi: To check influx to the capital of vehicles as well as migrant families from nearby districts, the government plans to put in place eight suburban rail projects aiming to provide fast mass connectivity to these districts. Of these eight regional rapid transit systems (RRTS), which will cover 640km, the government proposes to take up three on priority basis. where the capital gets maximum number of migrants. The NCRPB has proposed to take up Delhi-Ghaziabad-Meerut, Delhi-Gurgaon-Rewari-Alwar and Delhi-Sonipat-Panipat as the priority corridors. ‘‘The proposals have been approved by all the stakeholders of NCR — Delhi and three adjoining states. These will be put before the Central Cabinet for speedy implementation,’’ said a senior official of urban development ministry. Sources said though a majority of the dedicated RRTS corridors will come up along the existing railway network across NCR, their alignment could be shifted in some cases so that these become more accessible to commuters. The present rail network is already overburdened and there is hardly any scope for augmentation of the suburban rail services on the existing tracks. Hence the proposal to have dedicated tracks for RRTS. suburban rail and RRTS is seen as the second major mode (16.17%) for commutation. Planners claimed a proper and efficient transport plan could reduce the demand for private transport modes from 55.5% (in 2007) to 26.32% in 2032. The plan also states that the accessibility of existing tracks was very poor, discouraging passengers. Sources said that though the detailed project report (DPR) for the proposed corridors will identify the alignment, the frequency of these trains will be much better than the conventional EMUs running between Delhi-Palwal and Delhi- Ghaziabad. As four partner states together with the Centre have to contribute to the implementation of RRTS, the NCRPB has proposed the formation of NCR Transport Corporation. ‘‘It will be responsible for development of integrated multi-modal transport system, including commuter rail and feeder services in NCR. We have proposed to the railway and UDM to have 22.5% equity each. The four member states can have 12.5% equity each and the NCRPB can have the rest 5% equity,’’ said a UD ministry official.